Using the templates below, cut out six dresses from both fabric and fusible interfacing. Cut six collars out of fabric and double-stick fusible interfacing. Following manufacturer’s instructions, adhere the double-stick fusible interfacing to the collars and iron-on each collar to the dress. Adhere double-stick fusible interfacing to one side of each ribbon and attach to dresses. Apply fusible interfacing to the completed dress. Trim the ribbon where it meets the dress. Pin dresses onto background fabric. You can follow our placement or place them wherever you’d like. Either hand-stitch or machine stitch the dresses to the background fabric. We used a applique blanket stitch for our stitch. Be sure to leave the TOP of the sleves UNSTITCHED. These openings will be the space where the hair clips will clip onto. 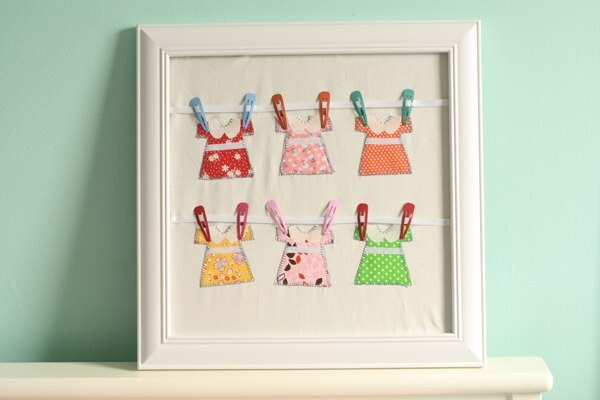 Take one piece of ribbon and determine how you’d like to place the clothesline. Use hair clips as guides. Repeat with other piece of ribbon and then pin. Stitch ribbon only at sides. With glass removed, place fabric in frame. Once the background is in the correct place, insert the frame backing and close. You may want to put the glass inbetween the material and the backing so that there is not too much extra space in between the frame. Pull excess fabric taut to smooth out like a canvas. Then, trim the excess fabric outside of the frame.